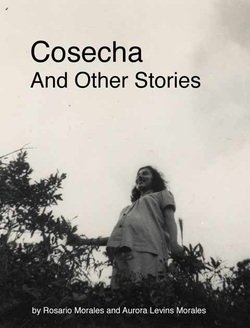 Cosecha is the culmination of a forty year collaboration with my mother, Rosario Morales, Puerto Rican feminist thinker, anthropologist, writer, visual artist and activist. Weaving together fiction and memoir, it continues our practice of mother-daughter call and response writing, established in our first book, Getting Home Alive. My mother, Rosario Morales, and I became writers together, and throughout our writing lives, we supported each other, read each others first drafts, and together, created a groundbreaking book, a call and response, mixed genre collection about our lives as U.S. Puerto Rican women, called Getting Home Alive. Now, more than twenty five years later, Cosecha gathers my mother's stories and mine, in a multi-layered mix of fiction and memoir. Go to the Short Stories page to read longer excerpts, and one full story. "Nights while the stars swung overhead we leaned in slow, delicious free fall toward each other’s arms, knowing we would arrive in our own good time. Apples, berries, nuts, pumpkins, late corn all spilled their abundance from the roadside stands. Around us the trees glowed in the colors of sun-ripe fruit, flickering and bright as faces turned to a hidden fire. But all the time the roots were reaching for a place deeper than the approaching frost, a race against the tilt of the earth's axis." "They lived now in a torrent of strife broken by small intimate truces. He spent his waking hours rehearsing what to say next, waiting for her to come back into the room to dispute or contradict and more and more frequently, to tell her what he felt, the anger, the grief at his life curtailed. The emptiness of no future. They cried together then. And sometimes, in the middle of his ever more frequent drugged sleeps, a quivering sensation woke him, a feeling he tentatively, reluctantly, identified as joy." "She was an excellent hostess, thoughtful, self-effacing and nurturing. Pale young lawyers, mustachioed cultural gurus, callow revolutionaries, mathematical near geniuses, and multicolored social butterflies of all sexes lunged against her upholstered furniture and hand woven pillows, amongst her statuettes and doilies, drinking, sneering, laughing, shouting, eating, necking, destroying reputations, puncturing egos and generally enjoying themselves. She moved softly among them, extinguishing cigarettes, replenishing drinks, re-refilling plates, extracting stilettos, applying band-aids, and restoring shoes, unseen and unheard." "Each afternoon while the birds rioted in the bougainvillea, the women of the house gathered in the shade of the green veranda with baskets of white thread and the sharp implements of their trade, and made lace. Looking over the edge of the ship as the island fell away behind her, Delia saw how the curved wooden planks cut the green water into white froth, and raising her face into the wind, she laughed that full, rich laughter that was to stay with her when every other sense had left her, until at the age of ninety three she laughed in the face of death, alone in a dark and silent universe."